This Awareness indicates that the conquest of the United States is not necessarily the beginning of the New World Order for Europe. 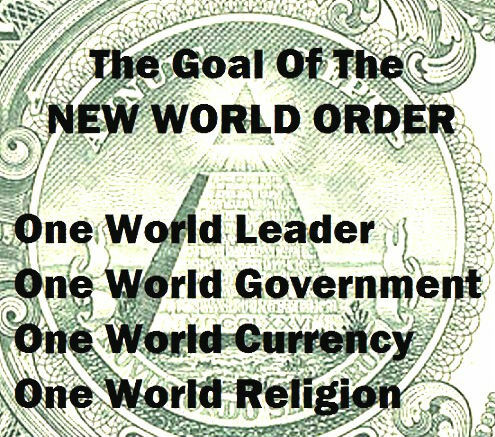 The United States would need to be conquered if the New World Order were to be set up, but the purpose of conquering the United States is simply to get it diffused as an independent country so it cannot or does not wish to resist the implementation of the New World Order. As for Europe, under the New World Order, the Bilderbergers are an organization that has been created, much as the Council Of Foreign Relation and Trilateralists in the United states was created, to bring these countries into the New World Order. The Bilderbergers as a great arm of the New World Order, to help secure Europe and those countries relating to the Bilderbergers into the New World Order. You must understand that the New World Order is generally an outgrowth of the Rothschild banking and political powers, who set up or greatly set up with the help of other organizations, the Communist control of Russia, who also set up the control of the Nazis in Germany during World War II by helping to fund the Nazi movement along with others, such as Henry Ford and some other large financiers of the world. This Awareness indicates that the Nazi movement and Communist movement, both being funded from these Rothschild wealth and power base, were but experiments and early efforts to establish some kind of purpose in bringing the great powers of Europe under control of the financial institutions owned by and controlled by the Rothschilds. The Rockefellers, who are often seen as competitors with the Rothschilds, are actually quite small in relation to the power and wealth of the Rothschilds, and could be squashed very easily by the Rothschilds powers. This Awareness indicates the Rockefellers forces include the Council Of Foreign Relations and the Trilaterist organizations, and these are helping to promote the New World Order. The Rothschild are promoting the New World Order under Zionism, and Bilderbergers and certain Mafia contacts and through most of the banking establishments, and therefore, even regardless of what happens in the United States, and the various countries of Europe will have their own problems relating to the controls being established through the Rothschild forces and the European economic system. The European community will be brought together as a large conglomerate of nations and will begin to have greater breakdown of boundaries as the nations are emasculated or diffused in terms of individuality. The definitions of each nation will begin to blur as the economics of Europe begin to spread and the boundaries are diminished whereby entities can travel from one country to another without passports or without excessive need for the usual customs evaluations that occurs at borders. NWO Plans 10 Regions: "Ten Horns of the Beast"
This Awareness indicates that the same will eventually encompass many of the Russian and Eastern countries in Europe, and eventually it is planned to encompass all of Asia. This Awareness indicates that the plan calls for the establishment of ten regions of the world; these are what has been referred to in the Book of Revelation as the "Ten Horns of the Beast". This Awareness indicates within the United States there will also be, according to the plan, Ten Regions, and these are that which is referred to in the Book of Revelation as the Smaller Beast that forces the masses to worship the larger beast. This Awareness indicates that in this sense, the UN, being funded mostly by United States money, is being promoted by the lesser beast, and when the lesser beast, the United Sates, becomes the New Republic, or the country having ten regions instead of 50 states, this country will then become more or less an enforcer of UN rules around the globe. There will be of course be cooperation from other countries who will help to supply troops, but much of the funding for such action of the UN will come from the United States. This Awareness indicates that it appears most of the funding, or the largest portion, will come from the United States, at least during the earlier stages of UN activity and world police enforcement. This Awareness indicates that this does not mean that the United States will be sending troops into Europe to enforce the New World Order on all of the people in all of the countries; it does not mean that the United States will become a new form of Nazi Germany on world conquest for itself. It means rather, that the United States will help to fund the United Nations in its various global projects in trying to bring resistance nations under control of the UN, and Europe itself will be organized slowly and gradually by the Rothschild organizations and the various leaders of countries who are working with these Rothschild energies as they convert their countries into aspects of the New World Order. Many of the countries of Europe will be asked to donate troops and money to the UN, and thus strengthen the UN as the centralized world-governing body to allow it greater power to conquer the rest of the world for the super-wealthy; there being approximately 13 families involved in this world conquest; the Rothschilds being the most notable of these families. This Awareness wishes to comment that the concept of a United Europe is not that different from the concept of a United States. The states in the United States Union were essentially and originally individual sovereign states that joined together in a kind of a union. To say "United States" is much like saying "Union of States." This Awareness indicates that the idea of a union of states was pure and could be very beneficial, but when the union of states get controlled from outside by the United States of America, Incorporated, in Washington D.C., whose jurisdiction in reality should only be its own ten square miles of territory, and when this union of states lets that corporation begin to rule them, because the corporation is capable of giving them large sums of money if they yield to their control, then a problem is developed. They are selling their souls to the devil, in a sense. The same can be said for Europe. If these countries, which are sovereign independent countries, join together, and if, in their joining together they allow some external corporation or country or organization or force to begin dictating to them, then they have lost something very important: their own sovereignty, their own right to make their own decisions. This Awareness indicates that first it may be very insignificant and unimportant. The decisions that are made may not be of great concern, but the time will come when the outside force begins to dictate heavier and heavier policies, imposing restrictions on these independent countries, so that freedoms, which were once commonplace, are no longer allowed. This Awareness reminds you that in 1933, Adolf Hitler spoke of a New World Order, seeing that it was his destiny to bring about a New World Order. This Awareness indicates you should also know that George Bush's father was one who helped finance Adolf Hitler into power and that George Bush belonged to the Skull and Bones Society in Yale University, which was an offshoot of the Skull and Bones Society in Nazi Germany. This Awareness indicates that the movement of the Nazis across Europe in Hitler's effort to promote the New World Order by force, by invading country after another, and by subjugating the various countries in different ways, should give you some indication as to what to expect in a New World Order, even though it will be much worse in modern times than in Hitler's times, because the equipment, the technology for mass control or mass murder, is much more advanced now than it was in Hitler's time. This Awareness indicates that if indeed your United Europe could unite with a focus on freedoms and the preservation of freedoms under some kind of constitution that guaranteed these freedoms and the rights of individuals, it could be most beneficial. But if it is simply a joining together for economic purposes and political controls, be very wary, for it is quite likely that these political controls will begin to become imprisonment controls, keeping entities under greater and greater control for the purpose of certain individuals.. This Awareness indicates that the Rothschild's headquarters are on a certain grounds that are independent of the British and of England. They are essentially sovereign territory areas so that the Rothschilds cannot be controlled by the English laws because they are on land that is sovereign or separate from that of England, much the way the areas know as Washington D.C. is separate from the states, and therefore technically, those committing crimes against the states, who live in Washington D.C., cannot be held for treason until they are brought back to their own state, or the neighboring states. As long as they are on foreign land, Washington D.C., these are not under the laws of the U.S,. Constitution or the States Constitution. Likewise, the Rothschilds are on foreign land in England and cannot be hold accountable to English law. This Awareness indicates that this is a way by which they create their own empire in the middle of London and carry on their mischief in such a way that allows them to be immune to any prosecution from English law, regardless of their fraud or misinterpretation or other crimes. Rothschilds: "The Head of the Beast"
This Awareness indicates that as long as entities understand this as being the Horn of the Beast or the Head of the Beast and can recognize the importance of staying separate from the Rothschild influence and creating a union of countries, they can do great things in the preservation of freedom in the future. But, you must realize too that the Rothschild agents are like cockroaches crawling around your home. These cockroaches crawl as over Europe; they are everywhere. They are all around the world: in the United States, in Europe, in Asia, in Africa, in Japan and the Orient. They are constantly maneuvering and working for the Rothschild purposes. When this Awareness speaks of the Rothschild purposes, It refers also to those cohorts, the other 12 super-wealthy families that associate or ride the coat-tails of the Rothschilds There are many families, but there are essentially 13 major families. There are approximately 300 families, but 13 major families that make up the international banking community, which is behind the organizations known as the Bilderbergers, Council of Foreign Relations, the various secret cults such as the Masonry and the Tong organization and the Mafia, -- all of these various organizations which are sub-orders of the international banking community families.